Medusa Ancient Art will be offering an initial selection formerly from the “Content Collection” of ancient rings, gems, seals and intaglios dating from 8th Century B.C. to the 6th century A.D. on their Web site. ...this collection would make a great addition to any collection of antiquities. Medusa Ancient Art today announced that they will be offering an initial selection formerly from the “Content Collection” of ancient rings, ancient gems, seals and intaglios. This collection of ancient art dating from the 8th Century B.C. thru the 6th Century A.D., includes 75 examples of ancient Roman, Sasanian, Phoenician, Samaritan, Gnostic, Egyptian & Islamic pieces acquired by Mr. Content when still a young dealer in the 1960's and early 1970's. The intricately carved pieces show depictions of many ancient gods and goddesses in antiquity such as Fortuna, Mars, Artemis (as shown), Athena, Serapis and Asclepius, as well as scenes from ancient daily life. The collection includes examples of the full range of materials available on the market for this type of ancient art. 1. A Roman Quadriga Ring; The gem depicts the Roman games 'Chariot Racing'. 2. A Sasanian Brown Sard Seal; Sasanian period seal, dating to the 223-651 AD, a fine example of antiquity of the Persian empire. 3. 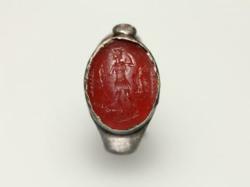 A Roman Intaglio of Asclepius; This Roman gem is interesting as it depicts Asclepius, the god of medicine and healing. The impression is well carved and nicely centered. 4. An Eastern Gnostic Seal of Abraxas; Interesting gem because it relates to the Early Christian mysticism and their relation of the universe to a deeper understanding of the divinity. 5. A Roman Jasper Intaglio of Mars; A fine example of Mars, the Roman god of war. 6. A Sasanian Agate Ring with Bovines; This Persian ring, from the Sasanian period, is very elegant and beautifully carved from agate. About Medusa Ancient Art Inc.
Medusa Ancient Art has been dedicated to providing private collectors, fellow art dealers, and museums with Egyptian ancient art and Classical antiquities. Their collection embraces the cultural history centered on the Mediterranean Sea, the early civilizations of the modern Middle East, and ancient Egypt. Over the past 15 years on the web, they have built a reputation for providing exceptional customer service and a long-term friendship with their clients. They share a common appreciation for the riches of our past and a passion for antiquities. Medusa Ancient Art is a proud member of the Art and Antique Dealers League of America (AADLA), Confédération Internationale des Négociants en Oeuvres d'Art (CINOA), and adhere to strict code of ethics.